"E=MC2" and "E=mc2" redirect here. 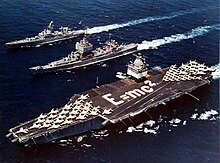 For other uses, see E=MC2 (disambiguation). This formula states that the equivalent energy (E) can be calculated as the mass (m) multiplied by the speed of light (c = ~7008300000000000000♠3×108 m/s) squared. Similarly, anything having energy exhibits a corresponding mass m given by its energy E divided by the speed of light squared c2. Because the speed of light is a very large number in everyday units, the formula implies that even an everyday object at rest with a modest amount of mass has a very large amount of energy intrinsically. Chemical, nuclear, and other energy transformations may cause a system to lose some of its energy content (and thus some corresponding mass), releasing it as the radiant energy of light or as thermal energy for example. The formula was initially written in many different notations, and its interpretation and justification was further developed in several steps. In "Does the inertia of a body depend upon its energy content?" (1905), Einstein used V to mean the speed of light in a vacuum and L to mean the energy lost by a body in the form of radiation. Consequently, the equation E = mc2 was not originally written as a formula but as a sentence in German saying that "if a body gives off the energy L in the form of radiation, its mass diminishes by L/V2." A remark placed above it informed that the equation was approximated by neglecting "magnitudes of fourth and higher orders" of a series expansion. In December 1907, Einstein expressed the equivalence in the form M = μ + E0/c2 and concluded: "A mass μ is equivalent, as regards inertia, to a quantity of energy μc2. [...] It appears far more natural to consider every inertial mass as a store of energy." , a useful equality. This is the relationship used for the container of gas in the previous example. It is not true in other reference frames where the center of mass is in motion. In these systems or for such an object, its total energy depends on both its rest (or invariant) mass, and its (total) momentum. The fact that the released energy is not easily weighed in many such cases, may cause its mass to be neglected as though it no longer existed. This circumstance has encouraged the false idea of conversion of mass to energy, rather than the correct idea that the binding energy of such systems is relatively large, and exhibits a measurable mass, which is removed when the binding energy is removed..
). The equation E = mrelc2 holds for moving objects. When the velocity is small, the relativistic mass and the rest mass are almost exactly the same. ^ a b Bodanis, David (2009). E=mc^2: A Biography of the World's Most Famous Equation (illustrated ed.). Bloomsbury Publishing. ISBN 978-0-8027-1821-1. ^ a b c d Einstein, A. (1905), "Ist die Trägheit eines Körpers von seinem Energieinhalt abhängig? ", Annalen der Physik, 18: 639–643, Bibcode:1905AnP...323..639E, doi:10.1002/andp.19053231314 . See also the English translation. ^ See the sentence on the last page 641 of the original German edition, above the equation K0 − K1 = L/V2 v2/2. See also the sentence above the last equation in the English translation, K0 − K1 = 1/2(L/c2)v2, and the comment on the symbols used in About this edition that follows the translation. ^ A.Einstein E = mc2: the most urgent problem of our time Science illustrated, vol. 1 no. 1, April issue, pp. 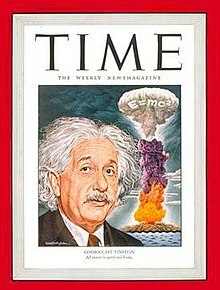 16–17, 1946 (item 417 in the "Bibliography"
^ "Einstein was unequivocally against the traditional idea of conservation of mass. He had concluded that mass and energy were essentially one and the same; 'inert[ial] mass is simply latent energy.'[ref...]. He made his position known publicly time and again[ref...]...", Eugene Hecht, "Einstein on mass and energy." Am. J. Phys., Vol. 77, No. 9, September 2009, online. ^ page 14 (preview online) of Albert Einstein, The Theory of Relativity (And Other Essays), Citadel Press, 1950. ^ a b c E. F. Taylor and J. A. Wheeler, Spacetime Physics, W.H. Freeman and Co., NY. 1992. ISBN 0-7167-2327-1, see pp. 248–9 for discussion of mass remaining constant after detonation of nuclear bombs, until heat is allowed to escape. is a genuine Minkowski four-vector, and the intrinsic origin of the square root in the definition of the relativistic mass is the distinction between dτ and dt. ^ Rainville, S. et al. World Year of Physics: A direct test of E = mc2. Nature 438, 1096–1097 (22 December 2005) | doi:10.1038/4381096a; Published online 21 December 2005. ^ The 6.2 kg core comprised 0.8% gallium by weight. Also, about 20% of the Gadget's yield was due to fast fissioning in its natural uranium tamper. This resulted in 4.1 moles of plutonium fissioning with 180 MeV per atom actually contributing prompt kinetic energy to the explosion. Note too that the term "Gadget"-style is used here instead of "Fat Man" because this general design of bomb was very rapidly upgraded to a more efficient one requiring only 5 kg of the plutonium–gallium alloy. ^ Assuming a 90/10 alloy of Pt/Ir by weight, a Cp of 25.9 for Pt and 25.1 for Ir, a Pt-dominated average Cp of 25.8, 5.134 moles of metal, and 132 J⋅K−1 for the prototype. A variation of ±1.5 picograms is of course, much smaller than the actual uncertainty in the mass of the international prototype, which is ±2 micrograms. ^ Einstein, A. (1905), "Zur Elektrodynamik bewegter Körper" (PDF), Annalen der Physik, 17 (10): 891–921, Bibcode:1905AnP...322..891E, doi:10.1002/andp.19053221004, archived from the original (PDF) on 2008-02-27 . English translation. ^ Philip Ball (Aug 23, 2011). "Did Einstein discover E = mc2?". Physics World. ^ MathPages: Who Invented Relativity? Hecht, Eugene (2009). "Einstein on mass and energy". American Journal of Physics. 77 (9): 799–806. CiteSeerX 10.1.1.205.7995. doi:10.1119/1.3160671. Early on, Einstein embraced the idea of a speed-dependent mass but changed his mind in 1906 and thereafter carefully avoided that notion entirely. He shunned, and explicitly rejected, what later came to be known as 'relativistic mass'. ... He consistently related the rest energy of a system to its invariant inertial mass.